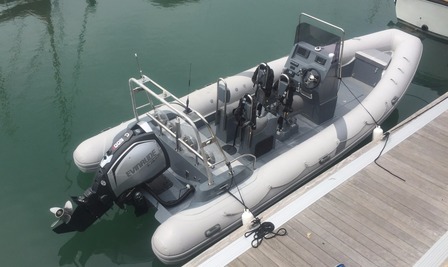 NEW PIRANHA RIBS FOR SALE - FROM £10,995 incl VAT!! All boats can be fitted out to the new owners specifications but come with console, seats, engine/gauges, warps and fenders as standard. The Piranha P750 7.5 metre Rib opposite is the perfect solution for anyone looking for speed, comfort, all round fun and adaptability. With the latest Evinrude 200hp High Output this boat will easily achieve 60kts and is a lot more economical than a 4 Stoke. 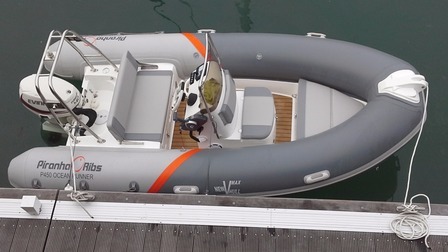 All our boats can be configured to your specification with additional storage or seating as required. Please contact us for more information. The boat pictured above and left is the very popular P450 Ocean Runner. For a small entry level boat these craft have fantastic sea keeping qualities and will easily hold their own against brands 3 times the price! A great all round contender..